Three men have just been charged in connection with a homicide in Roscommon County. The men were arrested Sunday, three weeks after the sheriff’s office says one of them shot and killed Jon Dirette. 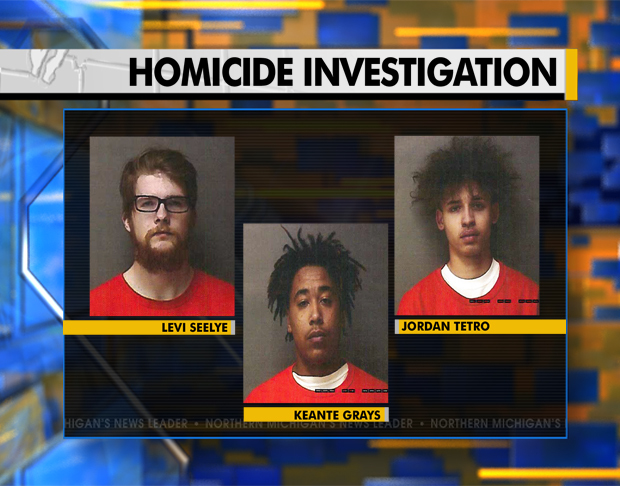 The sheriff’s office says Levi Seelye, Keante Grays and Jordan Tetro walked into Dirette’s home near Houghton Lake carrying guns and wearing masks. That’s when they say one of the men shot and killed Dirrete. All three men are now charged with murder, assault with intent to rob and felony firearm. “It has shocked our community. In a small Northern Michigan town, you don’t expect those types of crimes to happen. We all know each other, and when someone from our area is senselessly murdered, it has an effect on everybody,” said Roscommon County Sheriff Ed Stern. Police have not said which of the men they believe shot and killed Dirrete. It’s also not clear what the motive might have been. Stay with Northern Michigan’s News Leader as we continue working to learn more about this case.